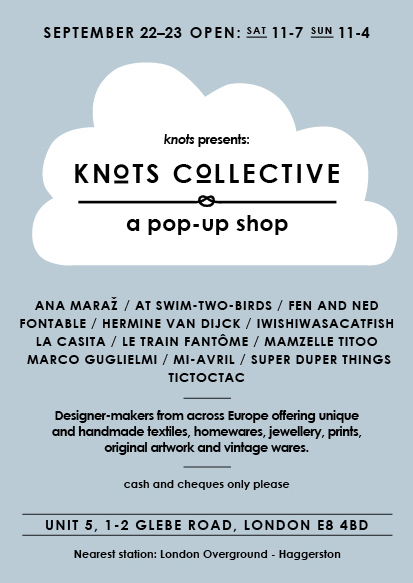 this is the flier that Louise and I were working on for the first "Knots Collective" pop up shop that will happen in London during the Design Week. Louise did the design and the graphic work, I just drove her crazy with my requests! There is quite a good bunch of people that have accepted to take part on this first Knots event. There will be a selection of handmade designs, some of them especially made for Knots Collective, and a selection of vintage items hand picked. I will follow up with posts of interviews with the participants. Hi mav, ohh I wish you could! :-) thank you! i wish i was in london... maybe a online pop up shop is next?! WSAKE, thank you! that sounds like a great idea. oh, i will miss the dates :( it looks so wonderful. Oh, I wish, like a dream come true. I do hope there wil be pictures! Seems like I haven't been updated on your last posts, I though you were still on holiday... must find out what might be wrong. i will tell my friend who lives in london, but would be nice to come by myself! good luck with all! Primo :-( what a shame! hope to meet you one day though! aaah fun, i would love to come and see all the goodness :) good luck!